The Great Barrier Reef has lost half its coral since the 1980s, scientists say. Australia's Great Barrier Reef has lost 50% of its coral since the mid-1980s, much of that because of a ravenous species of starfish that can each consume some 12 square yards (10 square meters) of coral in a year, scientists reported Tuesday. According to a study by the Australian government's Institute of Marine Sciences and the University of Wollongong, the coral cover on the world's largest coral reef ecosystem suffered damage from tropical cyclones (48%), the crown-of-thorns starfish (42%), and coral bleaching (10%). If current trends continue, the reef will lose another 50% of its coral in the next 10 years, the scientists said. Stopping the starfish infestation is the one thing humans can do that can save the reef, they said. "We can't stop the storms, and ocean warming (the primary cause of coral bleaching) is one of the critical impacts of the global climate change," John Gunn, chief executive officer of the institute, said in a press release. "However, we can act to reduce the impact of crown of thorns." "The study shows that in the absence of crown of thorns, coral cover would increase at 0.89% per year, so even with losses due to cyclones and bleaching there should be slow recovery," Gunn said in the release. Reacting to the study, the World Wildlife Fund said Australia must reduce fertilizer runoff as a first step to controlling the crown-of-thorns starfish. “The debate is over. This latest research demonstrates that more decisive action to cut chemical fertilizer is urgently needed to prevent unprecedented and on-going outbreaks of Crown of Thorns starfish, which are in turn converting the Great Barrier Reef into rubble,” WWF-Australia spokesperson Nick Heath said in a statement. According to the study, the starfish in its larval stage feeds on plankton, populations of which surge when fertilizer runoff floods the coastal ocean waters with nutrients. So plentiful plankton can lead to swarms of hungry starfish. The starfish consume the corals by climbing onto them, thrusting out their stomachs, and bathing the coral in digestive enzymes, which liquefy it for ingestion. Adult crown-of-thorns starfish, ranging in size from 9 to 18 inches in diameter and with up to 21 arms, can eat nearly a square foot of coral each in a day. The WWF's Heath said both the Australian government and the state government of Queensland, where much of the reef lies, need to take action now. “What this report shows is that we need urgent recommitment from both the Commonwealth and Queensland governments that will significantly reduce chemical fertilizer pollution on the Reef,” Heath said in a statement. “With the right political will we can stop the march of crown-of-thorns starfish in its tracks and save the reef," Heath said. The starfish threat to the reef is nothing new, according to the institute's report. The starfish have lived on the reef for 8,000 years, and swarms of the coral predators have been recorded as far back as 1962. The last major outbreak of the creatures was seen in the late 1990s. But pressure from the cyclones and bleaching resulting from climate change exacerbate the damage the starfish can do, the report said. "The combined effect of these disturbances may result in such regular coral mortality and reduced growth that communities cannot fully recover," it said. Previous efforts to curb starfish populations have been costly and ineffective, the report said. Those include cutting up the creatures (they tend to regrow their lost appendages) and injecting them with an acid (costs $300,000 a year and divers must inject up to 500 starfish a day). The WWF said $3 million was spent to control a starfish swarm in 2003 alone. 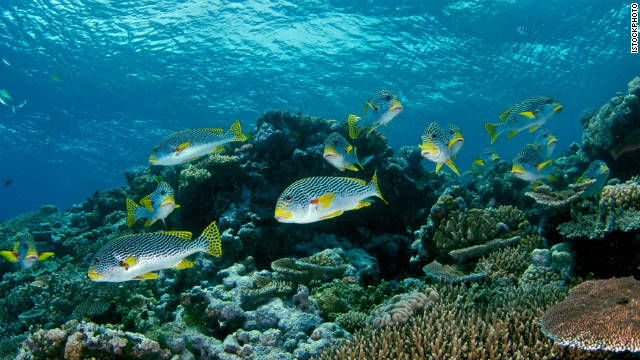 Besides protecting the environment, WWF said loss of the reef means loss of jobs for Australians. “Sixty thousand jobs in the tourism industry depend on us acting with urgency over the next few years,” the WWF's Heath said in a statement. WHATS THE PROBLEM?? WE, humans, have the answer to everything, don't we? We THINK that we can control the weather, control river flows, so why not control marine life? I have only seen pictures of this coral reef and it does look beautiful, but I tend to agree with those that say, let mother nature take care of itself. The other side of the coin is how many, humans, are interested in solving this problem because they make MONEY off of its beauty? Wow. Never heard of this situation. It wasn't in the media at all.Someone claimed its why the starfish on west coast were dissinagrating. It doesn't explain it or make sense. I don't think so. In these starfishes case the west coast its something like Monsanto round up ready causing starfish to fall apart. or handford more reasonable explanations. The frogs are cooking slowly as the scientist continue their studies and. being as how frogs in their primative nayural state are becoming rare farims are growing. them to sell as food and to science research. Outside of the new sources whole species of frogs disapear. This is nothing new as every animal not domesticated by man is endangered. and many a life form has been studied unto their demise. The money is there and the scientoist also study how to get the money and each year more scientist are added to their numbers. Science and scientist are two over used and little defined. The Florida Panther is no longer a panther but no more than a domesticated cat as each day tens of people photo monitor be tracking devices the scientist know exactly wher to lie in wait or the exact tree and den a startled cat runs to. This year due to budget cuts they can only afd a few more scientist to study more thouroughly ways to study more thouroughly the big cats before they dissapear completely. Their genetic pool so decimated and their restricted habitats are no longer true representatives of a once great animal. The call of "come on in the water is fine" is still being heard by the herd. You'd think with the WWF taking the lead on this, they'd just bodyslam the crown of thorns starfish. Thats it! Time for a regime change, in the name of national security and for humanitarian reasons... All Starfish must be killed, no due process! If you have to, use the drones. its time for the republic to begin operation republic.